Undocumented migrants and immigrants are sought out and criminalized by government forces in the U.S., and are, once again, targets for nationalist intimidation, violence, and racism. Even families seeking asylum are being arrested and separated, while the American public remains largely unaware of the causes of migration. -Why are migrants coming from Central America and Mexico? -What human rights abuses are occurring in the U.S. with respect to migrants? separation and indefinite detention had on the lives of migrant children? Director of the Institute for LGBT Studies at UA from 2007-2011. Her research focuses on the connections among queer lives, state immigration controls, and justice struggles. circulation of the phrase “It’s worse than the war” in the years since peace accords were signed in 1992. Great speeches and discussions, although it would have been good to have a member of the actual community we were discussing come speak about their experience. Both presenters were great! 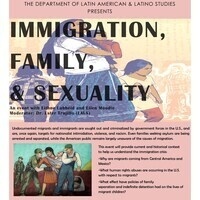 Very informative and great discussion on immigration issues.